This is a very straight forward, yet powerful, challenge. 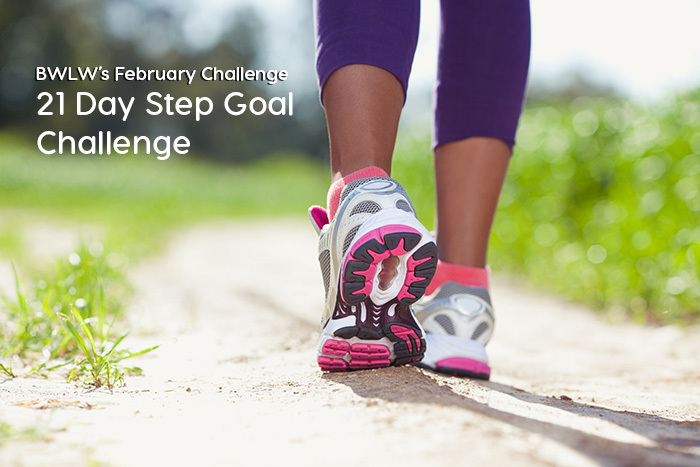 We are giving you a daily step goal (minimum – maximum) and challenging you to complete a daily task. You’ll find the printable daily checklist below. No sign up required. Daily Check-in: Share your totals on Facebook or Instagram each evening – Look for the Check-in post. Join our Facebook group for support. Walking, jogging, running… it’s up to you to decide how to get your steps in. You also will need a fitness tracker, pedometer or a mobile app that tracks your steps. If you have a Fitbit, join our FitBit Group. You’ll need a notebook or journal to complete some of the daily tasks. Check out our Step Goal Squad Shirts. Tip: If weather or time is a challenge, consider Leslie Samson’s walking workout DVD series. This book covers: Benefits of Eating Clean What Foods are Clean? – How to Eat Clean. – Importance of Hydration. – Eating Clean on the Go and at Work. – Frequently Asked Questions – Exercising While Eating Clean… and MUCH MORE! We want you to work at your own pace and do what is comfortable for your fitness level. This isn’t a competition and it’s not about perfection. It’s about challenging yourself to do the work. No judgement. Leave a comment below and tell us why you are committed to completing this month’s challenge. 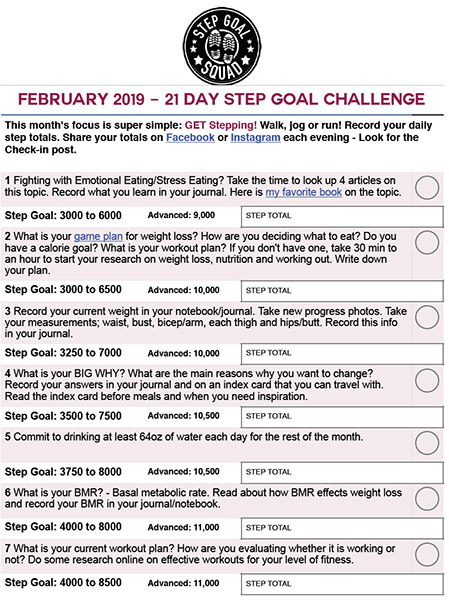 Record the number of steps you’ve done each day to keep track of your progress. Check off each task you’ve completed. If you haven’t signed up already, join our email list and stay up to date with our challenges, weight loss tips and more. Disclaimer* Before starting any exercise program, please consult with your doctor. We cannot be held responsible for any injuries resulting from attempting this exercise routine. If you have injuries that could be worsened, are pregnant, have knee issues, or are suffering neck and back pain, you should speak with a professional trainer about what workouts would be best for you. Do not attempt if you have current injuries, past surgeries or other physical issues/health issues that could be affected by exercise. Don’t forget to stretch before and after working out to avoid injuries. If you feel pain or severe discomfort, STOP. This post includes affiliate links. That means that is you make a purchase, we receive a small part of the purchase price. It’s one of the ways we keep the lights on. April Challenge Week 1 – Did you miss a workout? I’m in. I need this challenge to help me jump start my weight lose. I’ve just recovered from a bunion surgery that had me sitting way too long. I’m ready to be active again and move. I’m very excited about this challenge! I am ready to focus on my own self care. It has been such a struggle for me to maintain a healthy weight. As I age, I realize that I need more support with my weight loss efforts. Due to a cold I have not exercised in 3 weeks & it’s time to get my mo-go back & lose this weight once & for all! I love the way I feel after exercising!!! I’m so glad I get to do it with all of you because there is power in #s. !!! I slowed down over the holidays and this will help me get back on track. I need to keep back on track with my health and what a better way to do it than walking. me accountable, and I’m not doing well in getting myself back out there.